As of this week, Motorola Mobility is accepting pre-orders for the unlocked version of its Moto Z2 Play - a smartphone that's been available on Verizon Wireless since last month. Unlike Verizon's model, which has 32 GB of internal memory and 3 GB of RAM, the unlocked variant of the Z2 Play offers 64 GB of storage space and 4 GB of RAM. Perhaps that's why it's more expensive than the Verizon version, costing $499.99 (instead of $408). More storage space and RAM aside, the unlocked Moto Z2 Play offers the same features as Verizon's handset, including Android 7.1.1 Nougat, a Qualcomm Snapdragon 626 processor, a 5.5-inch 1080p display, water-repellant nano-coating, and a 3000 mAh battery. If you pre-order an unlocked Moto Z2 Play now, Motorola says it can deliver it to you on 18 August. 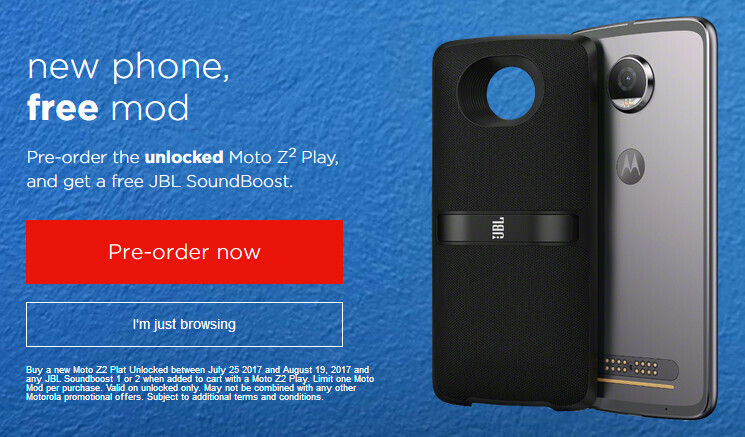 Furthermore, if you're purchasing the handset before August 19, you'll receive a free JBL SoundBoost Moto Mod. The unlocked Z2 Play can be used on any US carrier - Verizon, AT&T, T-Mobile, Sprint, and so on. So, do you plan to buy this smartphone anytime soon? Honestly? I think the first gen Moto Z Play at $399 is the better deal. If the play had a near flagship camera the price might be understandable, but not with what it has. Lenovo is going crazy with offer.. Processor 626 and very high price!.. Gimme Z2 Force unlocked with 6GB of memory and 128GB storage and bring back 3.5mm jack and I am so IN! The headphone jack may be reaching by Lenovo standards but the other stuff is already in the China edition, why not US too?